As a landlord you can serve the tenants different types of notices for different reasons. The type of notice you serve your tenant will have a big impact on what kind of decision you get if the tenant takes the case to court. It’s important to serve the right notice according to the situation so that you have a solid case if the tenant takes you to court over the notice or over actions taken after serving the notice. 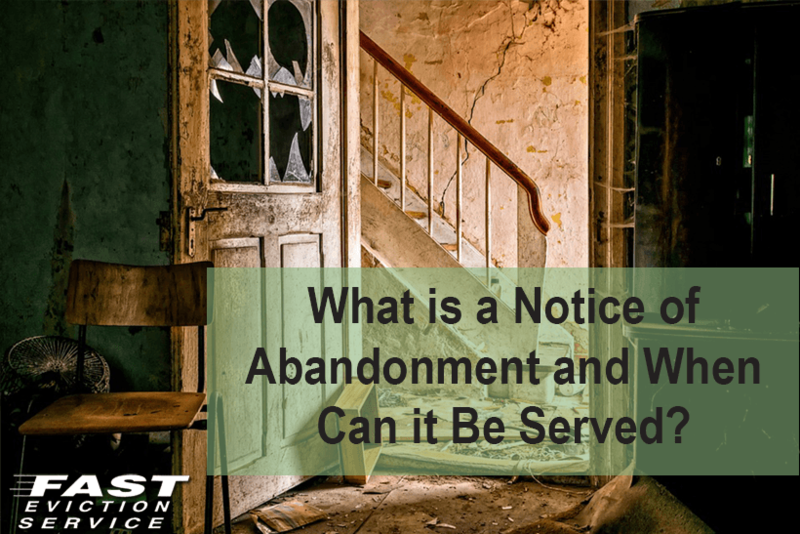 What is a Notice of Abandonment? The primary reason for serving the Notice of Abandonment is to notify the tenant that you have observed that the tenant is not at the residence for a certain period of time and has not informed you about it either. The notice notifies the tenant that you would consider the property ‘abandoned’ i.e. left by the tenant before the tenant agreement ends and therefore, you would be entitled to replace the tenant in case the tenant does not turn up soon. A Notice of Abandonment makes grounds for evicting the tenant but it can’t be used until and unless the tenant is actually not in the property and has left without informing you. When Can You Serve a Notice of Abandonment? There are some legal prerequisites before a Notice of Abandonment can be served to the tenant. The prerequisites depend on whether the tenant’s possessions are still inside the rental property or not. The tenant has not entered the house for seven days and the rent has been unpaid for 10 days. The tenant has not entered the house for five days and the rent has been unpaid for 5 days. In case either of these pre-requisites is met, you can serve the tenant a Notice of Abandonment. How to Serve a Notice of Abandonment? The Notice of Abandonment must be posted at every entry point to the rented property. It should also be sent to any address given by the tenant through certified mail. You need to give the tenant five business days after having sent the notice through certified mail to respond to the notice. In case the tenant does not respond, to the Notice of Abandonment you can proceed with the eviction process right away.